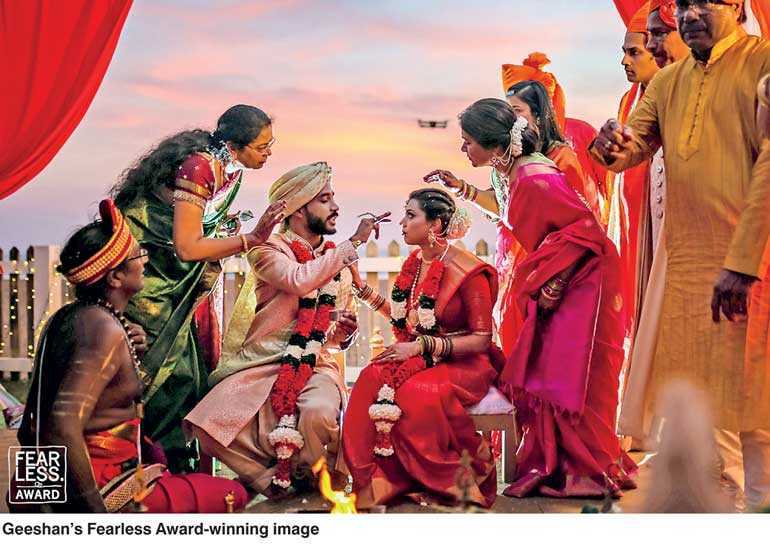 Earning kudos for the country and the industry, celebrated documentary wedding photographer Geeshan Bandara, was recently awarded a sought-after Fearless Award, his second one to date. Fearless Photographers is a unique community of 3,000 of the world’s best wedding photographers. These professionals are not afraid to push the boundaries of photography to surprise and delight clients with extraordinary images of their wedding day. The Fearless Competition is highly contested, with only the top 2% of over 9,000 submissions presented the prized Fearless Award. Wedding Photojournalism is a comprehensive and artistic documentation of the day’s events in an unscripted manner. Photographers capture real moments – the ones the bride and groom miss during the day – the laughter, unexpected tears, unbridled joy and everything in between. These are moments a trained and experience eye sees and anticipates. Ensuring these moments are recorded, Geeshan’s small team of talented and enthusiastic photographers specialise in photographing the beauty and sentiment of the day as it unfolds. They have photographed covered over 400 weddings, including grand, opulent events, to fun, intimate and private destination weddings. “We are fortunate enough to have clients from all walks of life, experience many different cultures and shoot all types of weddings. I work hard to document truly memorable moments because I want my clients to treasure their photographs,” Geeshan stated. While Geeshan’s first Fearless Award brought him international recognition in 2015, he is also the recipient of a series of other awards including two Reportage Awards, five Wedding Photojournalist Association Awards (WPJA), five International Society of Professional Wedding Photographers Awards (ISPWP) and 12 Professional Wedding Photographers’ of Canada Awards (PWPC).